Make An Appointment! Mail It In! The Device Shop is dedicated to 100% customer satisfaction, and has now fixed over 30,000 broken devices. Our experts have assisted thousands of customers and we want to help you. Do not go another day without getting your device fixed. Make an appointment today! The Device Shop has the ability to fix water damaged iPhone 6 Plus as well. Between our expert technicians and state-of-the-art Drybox®, there’s a good chance we can get your water damaged iPhone 6 Plus back to life. 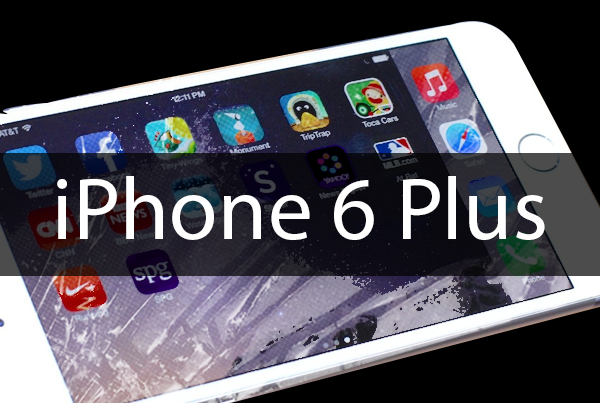 The iPhone 6 Plus is the 8th iPhone released by Apple. The iPhone 6 Plus launched on September 19, 2014 and screens, power buttons, and batteries began breaking soon after. The parts across for these models are the same and most repairs can be fixed within an hour. The Device Shop offers iPhone 6 Plus screen replacements in just 20 minutes using original LCDs and flex cables. The iPhone 6 Plus is also known to have poor battery life. The battery on the iPhone 6 Plus can be changed in less than 15 minutes. The Device Shop also is easily able to replace the dock connector on the iPhone 6 Plus in about 30 minutes. The Dock Connector on the 6 Plus is the same component that regulates the charging, the Touch ID sensor, and the headphone jack. If your iPhone 6 Plus has any issue pertaining to that listed above, this is the repair you’ll need. If your iPhone 6 Plus Camera doesn’t open, has spots, or is blurry you may need a new camera. The Device Shop can fix that as well. Bring it in so we can diagnose it, and if we can fix it, we’ll have you in and out in 30 minutes. iPhone 6 Plus Screen Replacements are the most common repair preformed by The Device Shop. Average Repair time is about 30 minutes and appointments are suggested. The current cost of the repair is $80 if you have a good LCD and touch. If there is any discoloration on your display, lines, or issues with touch, there is an additional $10.00 charge. The iPhone 6 Plus battery replacement takes about 15 minutes. If your device shuts off randomly, looses charge quickly, and you don’t get at least 5 hours of constant use, a battery replacement may be in store. The current cost of the iPhone 6 Plus Battery replacement is $50 + tax. The iPhone 6 Plus Dock Connector / iPhone 6 Plus Charge Port / iPhone 6 Plus Headphone Jack regulates several important components of your iPhone. First and foremost it regulates the charge. If your iPhone 6 Plus won’t charge, or charges intermitantly, there are several steps to take before you come to The Device Shop. Try different chargers and see if your charging cable is going all the way into your device. It should sit flush against your phone and the charge should be constant. If it’s not sitting flush there may be something blocking it, often times lint. If you have a tweezer you can try to get it out yourself, but be careful not to damage any pins. The Dock connector is also part of your headphone jack. If you have issues with your headphones being plugged in, only hearing out of one ear, something stuck in there etc. you may need to replace this part. The Device Shop charges $50 + tax to replace the dock connector / charge port / headphone jack on the iPhone 6 Plus and the repair takes about 30 minutes. iPhone 6 Water Damage repair can be tricky to fix. Whatever you do, DO NOT CHARGE YOUR PHONE. Once you retreive your device and realize it’s gotten wet, turn the device off immediately. It’s very important you bring your device to one of your locations as quickly as possible, as time is of the essence. Once you bring the device in, first thing we’ll do and open it up and see if there is any liquid still inside the device. If it is, we’ll stick it in our DryBox® to remove any excess liquid. Once the device is completely dried out, we’ll go through a series of steps to try to power on your iPhone 6. It’s also important to note that we do not offer a warranty on iPhone 6 water damage repairs. Even if the device turns on and is functioning properly, residual issues can appear. The Device Shop is not responsible for any residual damages. The iPhone 6 Plus Back Camera replacement is generally required when the camera shutter doesn’t open, or the app is crashing automatically. You may be able to toggle the front camera, but could freeze on the back camera. The iPhone 6 Plus Back Camera is $50 + tax to replace and takes about 20 minutes.